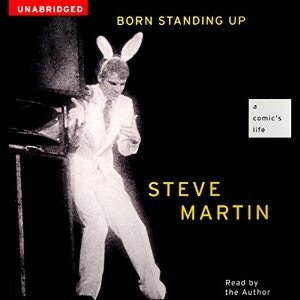 Synopsis: This book is the autobiographical account of Steve Martin’s career as a stand up comedian, how he got into it, and why he quit. He recounts the years he spent honing his craft and performing thousands of times before eventually hitting stardom. His story is a peeks into the world of a live performer and celebrity. My thoughts going in were that I’d probably get some good insight into how an artist like a stand up comedian hones his craft and achieves celebrity through show business. I put the book on my audible wish list because of a recommendation I heard on one of Tim Ferriss’s podcast episodes, and saw that there were thousands of positive reviews. My experiences with biographies of successful people have been good up until this point so I thought it couldn’t hurt. I typically read about business titans, so a biography of an artist seemed like a good change of pace. The book was actually a shorter read than I thought, but I loved how it focused a lot on not only his rise to fame, but the connections with his family, friends, and love interests. I thought it started out pretty slow and uninteresting, but picked up near the end. The last few sections on his parents and then the nostalgia of his old performance spot really tugs on the heartstrings. One of my biggest takeaways is to go in with the naïveté of a beginner and keep doing it. Don’t overthink and convince yourself you’re not cut out for it. Try, tweak, try some more, get feedback, go through the numbers, and eventually you’ll hit a tipping point.